davidjsablan So, this is it. . . the straw that broke the camel's back. We are angry because Archbishop Apuron has betrayed us faithful Catholics of Guam. I tried to meet with him to let him know what he has done in dividing us between the NCW follower, of which there are less than a thousand of our friends and family members, for whom I pray daily so they can see the scam in the NCW, and us true Catholics faithful to the teaching of our Church. Fr. Adrian, the Chancellor, said he will get back to me. Never did, and it will be one year in June. I laid out in writing issues I'd like to discuss with the Archbishop. No feedback. So, the silence is deafening. 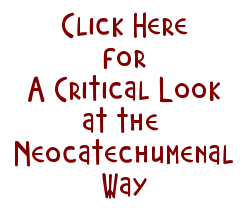 It only tells me these people at the Chancery and in the hierarchy of the Neo-Catechumenal Way are cowards. They are secretive and not open to welcome those of us who want to be closer to God as they say you can be if you join the NCW. What kind of Catholic organization does not open itself to more members? No, their "mission" on Guam is to milk us dry and take over the Archdiocese stealthily. But thanks to many concerned Catholics, the "cat is out of the bag." There is no stopping the Good now. Pius, Gennarini's. . . it is time for you to leave Guam. Dust your sandals and move on. . . we don't want your "new evangelization" here on Guam. We are happy with our real diocesan priests and the good Capuchins and Jesuits who have nurtured our Faith over generations since Pale San Vitores brought the Faith to our shores. We don' need this new evangelization you are offering. So, go home. Go on "mission" back to where you all came from and stay there. Our Lady has protected Guam, and has provided guidance to us to follow the true teachings of her Son. We are content with that. So leave Guam and leave us alone to enjoy our Faith traditions which has enriched our souls with God's grace over many generations. If it ain't broke, why fix it. I stand united with Tim Rohr CCOG and laity Forward. We devoted catholics desire only the Holy Mass the sacraments of our church and our devotions. The faith of our Fathers that has sustained and guided us since birth. The faith of the church that will lead us all one day to the eternal banquet with Our Lord. The NCW has caused only division and anxiety on Guam. It has no place on Guam in the lives of a people who remain faithful and loyal to sacred Tradition. I am praying that authentic loyal catholics who respect catholic values culture Tradition all join together with Tim Rohr CCOG Laity forward. Send your message loud and clear. " Go home NCW you are not welcome on Catholic Guam." I encourage everyone to be loyal to the See of Peter the One Holy Catholic Apostolic Church. To be loyal to the Holy Mass the Sacraments our Tradition. To the NCW be loud and clear. NCW is not welcome on Carholic Guam. Make your voice heard take to the streets and protest. Congratulations to the brave men and women who protested at Guam's international Airport. Your voice echoed all the way to the breakfast tabel of the Santa Martha Guest house. We ardently desire that the person eating at the breakfast table at the Santa Martha Guesthouse would intervene and save the Catholic Church of Guam. While, I appreciate your sentiments, Agnes, this is precisely what we DO NOT WANT. Once again, this is the kind of "colonized" mentality that has not only kept our local Church down, but has permitted the conditions under which more than half the population of Guam has become part of the dependent class: a welfare state. It is this idea that we cannot help ourselves, that we must depend on outside help to fix our problems, that has permitted the problems in the first place. And even should someone "fix" our issues, we will be right back in the same fix again in a few years because we did not learn how to put our own pants on and tie our shoes. Our goal from the beginning has been to create an "arduous and painful closure" to the assignment of one Anthony S. Apuron. Don't deny us the pleasure of finishing the job by having Rome come in and give him an easy out. He has destroyed lives for decades. Rome needs to learn its lesson too. They'll think twice before the appoint the next bishop. Tim, we saw Msgr. James at Pizza Crust having lunch with the head of the FBI. In fact he's been seen frequently at the FBI office. Is there something going on here we don't know about? Msgr.James is chaplin to FBi so it would be normal for him to have lunch with FBI. However, it would be true to say that Archbishop Apuron is on FBI watchlist. Thankyou for your observation. We should be ashamed of ourselves? HECK NO! We are proud of the brave Catholics who braved the late night hour to come out to meet and and tell the “head huncho” of the NCW in Guam to “Go home! Take your NCW with you! We don’t need you; we never did!”. •What faithful Catholics did last night at the airport was NOTHING compared to the anger that Jesus showed when He saw His house or prayer being made into “a den of thieves…” In just anger Jesus turned the tables of the money changers upside down, turned a piece of rope into a whip, and drove the money changers out of His of House. •So to the question do “What would Jesus do?” (which is a catch-phrase these folks say whenever they feel being persecuted – Joy! Courage!”) – read Matthew 21:12-13). That’s what JESUS WOULD HAVE DONE! •Go find or build yourselves another church, another venue, but don’t practice your religion within our Catholic Church, by invading our churches – NIMBY! We could possibly tolerate your heretical teachings (as we do other religions), but don’t do it in OUR churches. •The “Go home Genarinni’s!” is a message we delivered to the “head huncho” of the NCW, to take his cultic religion and evangelize elsewhere – North Pole would be a good place, plenty of gullible seals and bears there! •We hope the Genarinni’s got the message clear. 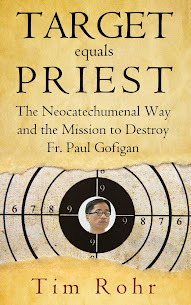 We don’t want their religion being pushed down our throats – and down our throats they do get pushed, when our very own supposed shepherd (Archbishop Apuron) divided us Catholics into “we vs them” (NEOS VS NON-NEOS) when he aligned himself publicly with the NCW – and continues to ordain and protect Neo priests (presbyters). Well said Joe. People need to read and understand what's happening. The Archbishop and his NEO group is to blame for not sitting down and being transparent. They had years to fix this problem they have created. As for OJ, his little smirk and remark he made on the news like he is better than the Laity makes me sick. He is no priest to us. And to be avoided by Catholics as a priest speaks for itself. He has no credibility and never will. Yup, Edivaldo "The Juicer" is one smug, arrogant boy. And boy is he UGLEE! !